World Weaver Press, 9780692430217, 234pp. A flock of shiny stories Associated with life and death, disease and luck, corvids have long captured mankind's attention, showing up in mythology as the companions or manifestations of deities, and starring in stories from Aesop to Poe and beyond. 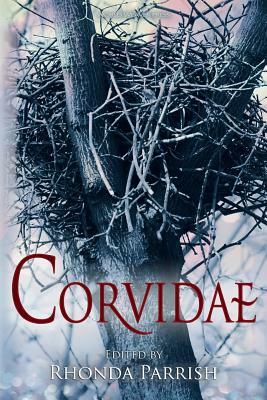 In Corvidae birds are born of blood and pain, trickster ravens live up to their names, magpies take human form, blue jays battle evil forces, and choughs become prisoners of war. These stories will take you to the Great War, research facilities, frozen mountaintops, steam-powered worlds, remote forest homes, and deep into fairy tales. One thing is for certain, after reading this anthology, you'll never look the same way at the corvid outside your window. Featuring works by Jane Yolen, Mike Allen, C.S.E. Cooney, M.L.D. Curelas, Tim Deal, Megan Engelhardt, Megan Fennell, Adria Laycraft, Kat Otis, Michael S. Pack, Sara Puls, Michael M. Rader, Mark Rapacz, Angela Slatter, Laura VanArendonk Baugh, and Leslie Van Zwol.